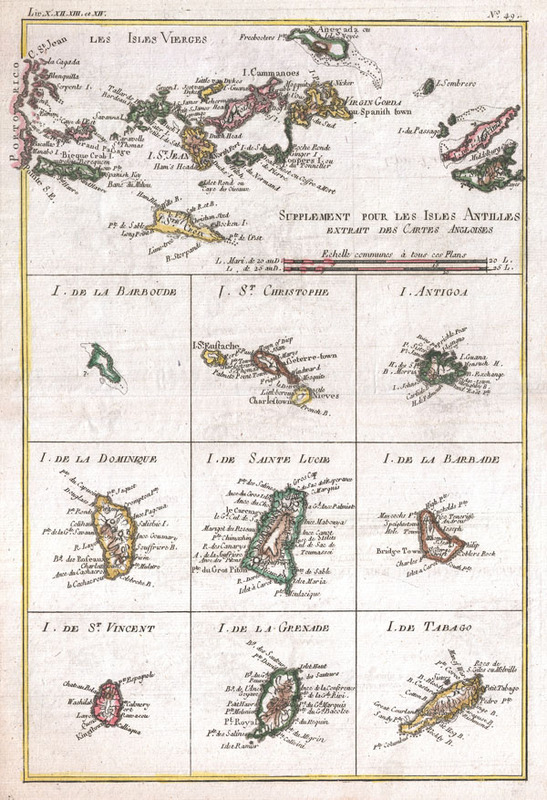 Les Isles Vierges, Supplement pour Les Isles Antilles Extrait des Cartes Angloises. A fine example of Rigobert Bonne and Guilleme Raynal's 1780 map of the Antilles or West Indies. Essentially 10 maps in one. Uppermost map is the largest and details the region from Porto Rico to St. Martin, encompassing the Virgin Islands. Nine smaller maps include: Barbados, St. Christopher, Antigua, Dominica, St. Lucia, Barbuda, St. Vincent, Granada, and Tobago. All identify important towns, ports, and topographical features. Cartographically these maps are based on English nautical charts of the period. All names and text in French. Drawn by R. Bonne for G. Raynal's Atlas de Toutes les Parties Connues du Globe Terrestre, Dressé pour l'Histoire Philosophique et Politique des Établissemens et du Commerce des Européens dans les Deux Indes.